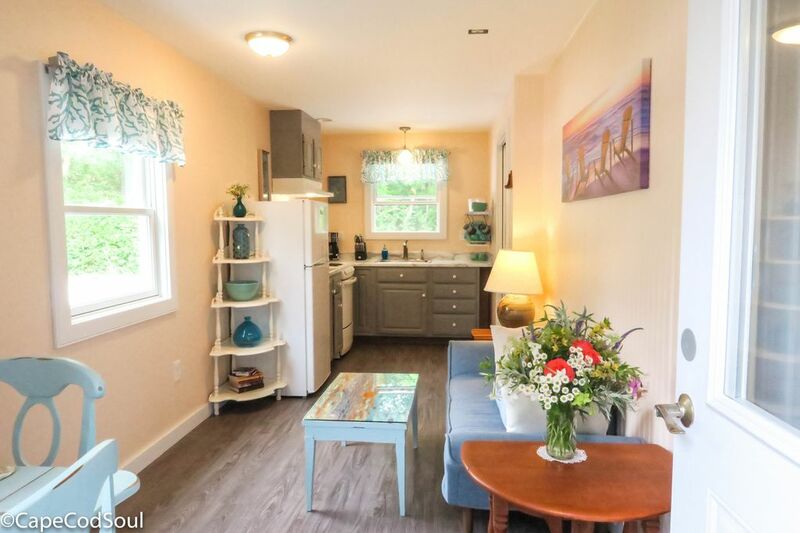 1 Bedroom, 1 Full Bath, Sleeps 2, Full Kitchen Clean & Cozy, Beautiful Brand New Wainscotting in the Traditional Cape Cod Decor! We are located near the Bay Beaches and the popular Cape Cod Rail Trail. We are a short walk to restaurants, coffee, Ben & Jerry's ice cream & shopping. We are a short drive to the ocean and the Cape Cod National Seashore! This property is newly renovated with new mattresses, linens, towels, pillows, updated kitchen, WiFi & Cable, TV, Window A/C First Floor. The kitchen is stocked with plates, cups, silverware, coffee maker & filters, microwave, blender, toaster oven, spices and more. We are not new to renting, but we are new here on VRBO. We have introductory affordable rates for Summer bookings. Our property is newly updated and we are looking forward to sharing our slice of paradise with you and providing a fabulous vacation experience in a place we love. Hello, We are your hosts, Lucy & David. We reside year round on Cape Cod. We enjoy beaching, traveling, cooking, fine food, boating, camping, clamming, fishing, flowers, gardens, art, and we love our friends and family! We respect total privacy for our guests. We have two pugs, Leo and Oliver and they are either in our house or in a fenced in yard on the opposite side of the building/rental. They are very friendly! Although we love dogs and pets this apt is pet-free and non-smoking. We love our location and our year round beach life on Cape Cod. We take pride in sharing our slice of paradise with you. Clean, comfortable, private & affordable. This property is very affordable, brand new this season, clean, clean, clean with experienced and friendly property managers. This rental is new to the market in July 2017 so you can book a premium property for your last minute vacation this summer. This rental is perfect for a solo traveler or a couple. This apt can also be booked with our sister listing on VRBO if you have a larger family. Our sister listing sleeps up to 8. So grateful that the air conditioner cooled the whole place during this heat wave and that the mattress was firm . .. those two things are priceless to us when travelling. Overall, the lovely art work, plantings, and private brick patio provide a setting for a lovely cape escape! What a terrific spot, so comfortable and clean, a short bike ride to the beach, and a easy ride to the Cape Cod Bike Trail. The apartment is sweetly decorated and once inside it, I felt like I was in my own private cottage. I never heard any neighbors. Lucy and David were never too far away, if I needed anything. I highly recommend this stay! Very new and excellent location on the Cape. This is a small cottage but is very nice and very new. The location is excellent--Eastham is in the middle of the Cape--about 20 miles to Hyannis and about 20 miles to Provincetown. The downside on the cottage is that the bedroom is on the second floor and the steps are very steep and could be difficult to negotiate depending on your age and one's physical capabilities. The bathroom is on the first floor which could create challenges if you need the facilities during sleeping hours. The couch in the living room is very smallish and is uncomfortable. On the plus side, Lucy is very friendly and helpful. She even did our laundry and was always available to give counsel on planning activities. Lucy and David do their own landscaping and they do a great job! The gardens are well manicured and are beautiful. This cottage has its own patio which is very nice. The beaches available nearby are on the bay side , so if you want the Ocean this not your place. Really nice space for 2! Great space for a couple. You couldn’t get kids in here, nor should you. Air conditioning was a huge plus since we had a massive heat wave - AC is not something a lot of other rentals offered. Great location in the best part of the Cape (in my opinion). Lucy was great and got us in early as soon as it was cleaned. Highly recommend this spot if you’re not looking for a mansion and just want to enjoy the beaches and great surroundings. I loved this place, well equipped, clean, so charming and relaxing. Very close to beautiful beaches, nature, restaurants, and towns. I really enjoyed my stay and I am looking forward to coming back. Thank you Lucy for making my retreat so comfortable! We are centrally located on the lower cape. We are close to the Bay Beaches, The Cape Cod National Seashore and the Cape Cod Rail Trail for biking. We have easy accessability to Orleans for shopping, dining and The Rock Harbor Charter Boat Fleet for sportfishing. We are a short drive to the Wellfleet flea market, surfing and the drive in. Provincetown is at the furthest point on the Cape and this is a wonderful place to go on a whale watch, shopping, dining, and venture along the wharfs and marina to see the older fishing boats.